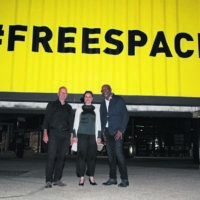 #FREESPACE is an initiative that encourages the use of public spaces to engage in public discussions, talks and showcases. This initiative is a project of Instinct, undertaken for the V&A Waterfront, in partnership with Zeitz MOCAA and the African Centre for Cities at UCT, with additional support from various donors. In the Silo Arena, an industrial container that has travelled over 173 809km to various countries in the world has been placed as a platform for engagements. The container symbolises a bridging point between people and their perspectives on space. Leszek Dobrovolsky is the curator of programmes at Instinct says the container has been reused multiple times, thus conceptualising the idea of a container as something that can be used for various things. “People can also think of public spaces in the same way. Industrial containers have many uses – some people turn them into shops and other people use them for storage. [So] if we think of public spaces in the same manner that people think of these containers, we can actually achieve more,” Dobrovolsky says. The programme started early this month and will run until Sunday 17 February at the Silo District. This article by Thabang Kuaho for the People’s Post was published on News24 on 29 January 2019.